I remember discussing with my math and physics teacher. I was about sixteen years old. She argued that the attraction the Earth exerts on any bodies around it increases as we get closer to the center. My intuition was telling me that if gravity acceleration is caused by mass, the point of maximum gravity should be the surface of the planet, not the center. At the center of the earth we would be surrounded by mass, so nothing would be pulling us towards the center of the Earth anymore. I believe she probably had this formula in her head: F = G*m1*m2/r*r. That’s Newton’s law of universal gravitation. In that formula, as the distance between the two masses decreases, the force gets stronger. If the distance ® would approach 0, the force (F) would increase towards infinite. This formula is useful if we consider the two masses (m1 and m2) to be points. But the Earth is not a point. Points have no inside and outside, but this planet does. Somehow a few days ago, twenty years after that discussion, these ideas came back to me. So I went and asked Mr. Internet. It turns out we were both partially right. The gravity acceleration does not immediately decrease as we move towards the center of the Earth, as my intuition had told me. In fact, it first increases a little as we go down. There are at least two reasons. One, the effect of the planet rotation, which tries to throw us up into space, is stronger on the surface than down below. And two, density of the matter inside the planet is not always the same: it changes depending on the depth. 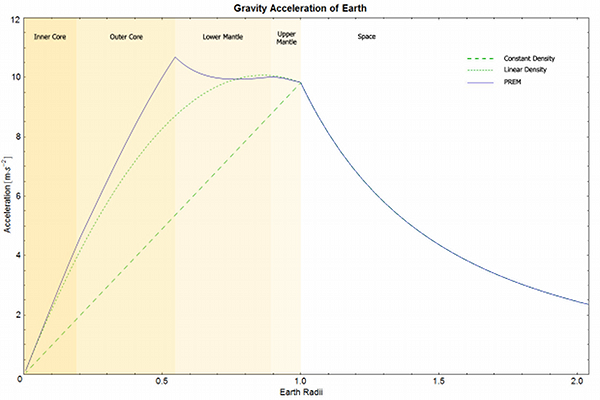 That means that as we start digging towards the center of the planet, the gravity acceleration initially increases, reaching the maximum at about half way through our trip to the center of the Earth. But after that it decreases down to zero, as I had suspected. My teacher did not appreciate so much my ability to get the right answers without knowing or remembering all the theorems and rules. At least publicly she didn’t, I don’t know what she thought about it. In any case I believe it was an ability to be promoted, not something to get rid of. My feeling is that teachers wanted students who were able to memorize things, not understand them. That’s why I find this video important: Changing Education Paradigms, why I enjoyed the book Hackers and Painters. And maybe one reason why I’m interested in the Khan Academy and recorded almost 100 episodes of Fun Programming. The two images are Creative Commons material. You can find the license and author information here and here.